The first official day of spring is Sunday, March 20th (the earliest arrival of spring of our lifetime so far in the Northern Hemisphere, according the the Old Farmer’s Almanac). This is also the first official day of termite season! It’s also important to know what to look for. Identifying a termite infestation early is key in preventing damage to your home. Termites swarm in the spring and although swarming termites don’t cause damage, it’s a sign of a destructive termite colony nearby. 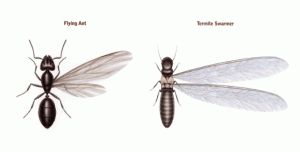 Swarming termites are often mistaken for flying ants; they have two pairs of long narrow wings, equal in size and, unlike other termites in the colony, are dark or black in color. Warm or wet weather brings termite (subterranean) swarmers out of their nest, typically during daytime hours, to start new colonies. They’re attracted to light so you’ll most likely see swarming termites around windows, doors, and light fixtures, or the wings they sometimes leave behind. If you notice termite swarmers in your home, it’s a good indication of an established termite colony nearby, that could be causing significant structural damage. If you have an active termite warranty, call your exterminator and request a termite inspection. If termite activity is found, you should be provided with termite treatment options and, depending on your warranty’s coverage, damage repair solutions. If you don’t currently have termite protection, call a professional termite control company immediately. They will provide a thorough inspection of your home (usually free) and give you the best treatment options to eliminate the active termites and prevent a future termite infestation. 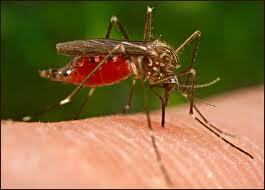 Be sure your pest control provider offers multiple warranties with damage repair options. Some even offer lifetime damage repair warranties with termite baiting systems, like The Advance Termite Baiting System, an eco-friendly alternative to termite control as well as Liquid Treatments featuring Termidor Termiticide, the most effective and long lasting liquid termite product in the industry! !